The latest coin from the Perth Mint is now available on Silver.com. The Silver Australian Kangaroo is an all-new silver bullion series from Australia’s oldest mint, and is the first silver coin in mint history struck with .9999 fine silver. 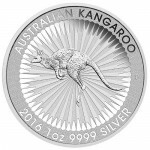 Today, the 2016 Silver Australian Kangaroo is available in near-perfect condition on Silver.com. First ever striking of the Silver Australian Kangaroo. Bears the image of the red kangaroo on the reverse. Silver Australian Kangaroo coins debuted for 2016 as the newest Perth Mint coin inspired by native wildlife. 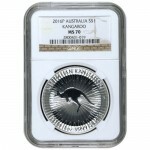 The Silver Kookaburra and Silver Koala coins, introduced in 1990 and 2007 (respectively) are immensely popular coins. Silver Australian Kangaroo coins are expected to follow in the design footsteps of the Kookaburra and Koala, using different depictions of the marsupial each year. 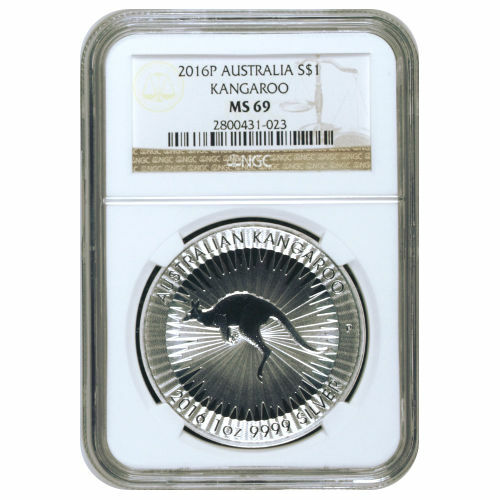 These 2016 1 oz Silver Australian Kangaroo coins earned MS69 grades from the NGC. Considered a near-perfect specimen, each coin has its full, original mint luster. However, each has a maximum of two minor detracting flaws, such as miniscule contact marks or minor blemishes. On the reverse is a depiction of the red kangaroo species as created by Dr. Stuart Devlin, goldsmith and jeweler to Queen Elizabeth II. This image is accompanied by engravings noting the coin series’ name, the year of issue, weight, purity, and metal content of the coin. 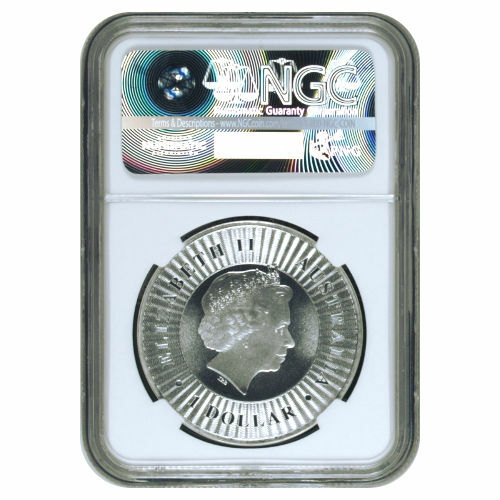 The obverse features a right-profile portrait of Her Majesty Queen Elizabeth II. Her image has featured on the obverse of commonwealth coins since she ascended to the throne in 1952, and this specific design is from Ian Rank-Broadley. It was created in 1998 as the fourth-generation depiction of Her Majesty. Perth Mint is the oldest operating facility in Australia. Originally part of the Royal Mint system of the British colony, control of the facility was returned to the state government of Western Australia in the 1970s. Today it operates as a separate entity from the Royal Australian Mint. Please direct your questions to a Silver.com associate at 888-989-7223. We’re also conveniently available online using our live chat and email features.